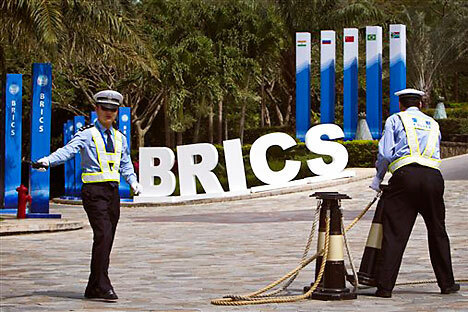 With the addition of South Africa, the informal group of emerging economies known as BRIC has become BRICS. The expanded group is currently meeting for the first time at a summit in the Chinese city of Sanya. But while the composition of the group has changed, the question remains the same: What exactly unites these countries, with all their geographic, cultural and political differences? There is simply no precedent for BRIC in the history of international organizations. The clever acronym was coined by Jim O’Neill of Goldman Sachs as a way to generate interest in developing markets among the investment bank’s clients. Now the acronym has taken on a life of its own. Russian political scientist Vyacheslav Nikonov has called BRIC a self-fulfilling prophecy. The global financial crisis exposed differences in the level of economic development among the BRIC nations, leading skeptics to predict an early end for the group. Western commentators have been especially perplexed by Russia’s presence in BRIC. What is a petrostate with vague prospects of modernization doing among the future leaders of the global economy? Russia indeed stands apart from the other members, and not only because it is growing much slower than China and India. The economies of Brazil, India, China and South Africa have all seen a steady upward trend in the last two decades, lifting the countries (with varying degrees of success) from poverty and backwardness. Russia suffered an unprecedented decline 20 years ago. It has made progress since but has not yet locked into a stable growth trajectory. However, it has not sunk to Third World levels either, even in the immediate aftermath of the Soviet Union’s collapse. Simply put, the problems that Russia has encountered are very different from those facing the other BRICS members, who are outpacing Russia in terms of economic growth. There would be grounds to question Russia’s inclusion in BRICS if the group really were all about economic growth, as Goldman Sachs would have it. But BRICS is primarily a political group that emerged in response to the obvious need for a more diverse and less Western-oriented global political structure. Foreign Minister Sergei Lavrov said recently that for Russia, BRICS is first and foremost a geopolitical association. The surprising unanimity displayed by the BRIC nations during the UN Security Council vote authorizing military intervention in Libya is telling. Russia, China, India and Brazil all abstained, suggesting a coordinated position. South Africa supported the Western coalition. There are several reasons for the growing interest in BRICS. First, it is becoming increasingly clear that the structure of global institutions does not reflect 21st century realities, while talk of reform remains just that – talk. To be sure, these five very different countries do not agree on everything. But they are united in their dissatisfaction with their status in the world, even if their reasons are different and even incompatible. Existing political structures were built around the bipolar world of the Cold War and have remained virtually unchanged since. The BRICS nations want a political structure that reflects the multi-polar world that is taking shape. BRIC declarations have rightly questioned the legitimacy of the existing system. But there is little hope that the permanent members of the UN Security Council (a relic of the 1945 balance of power) will voluntarily share their privileges with other countries. True, this also applies to the two BRIC countries that are permanent members, Russia and China. Second, current global problems demand entirely new approaches. The five BRICS nations believe that the West has monopolized the global debate. This is at odds with the political and economic balance of power in the world, and serves only to inhibit the fresh solutions that could result from a more inclusive discussion. Third, all of the BRICS nations have found it difficult to increase their influence on the world stage within existing institutions, and they have been looking for ways to strengthen their negotiating position in the ongoing process of forming a new global political structure. The fact that they represent different parts of the world lends even more weight to their aspirations. For now, the BRICS nations are rapidly developing countries. But they might also be the main poles of the emerging multi-polar world. To see BRICS solely through the lens of economic growth is to miss the point. BRIC is a useful concept for Russia, which has struggled since 1991 to find a stable identity in the global political arena. It would be hard to imagine a better way to steer global politics in a non-Western direction than BRICS. Following the collapse of the Soviet Union, Russia was reduced to the level of regional power. The concept of BRICS offers Russia a way to reassert its global aspirations and to draw attention to its economic progress. Moreover, BRICS allows Russia to do this in a non-confrontational way. All BRICS members deny that the group is directed against anyone. But the United States is unconvinced, and sees BRICS as a threat to its power. BRICS members deny this if only because they all have closely interdependent relationships with the United States, be they economic (China, India, Brazil) or political (Russia). Contrary to BRICS’s assurances, however, analysts rightly point out that the group can only increase its influence at the expense of Western influence.